Excerpt of an interview conducted by UNAAB Bulletin, with the former Nigerian President, Chief Olusegun Obasanjo, while on a facility inspection visit to UNAAB. UB: We are very glad that you are here, with us and we consider this as an assessment of a personal initiative. You appointed the Vice-Chancellor, he came in, almost through a turbulent situation when part of the community was almost saying, you can’t be our Vice-Chancellor and now he had done this. You’ve come back Sir, to assess what the situation is. What is your impression, Sir? 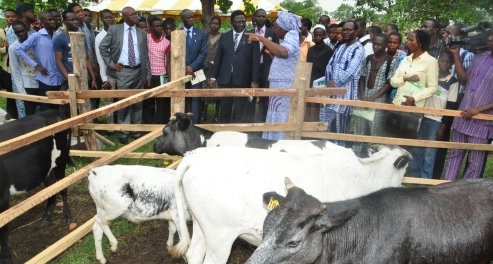 OBJ: I have abiding interest in the University of Agriculture, Abeokuta. Coming into existence of University of Agriculture was not without my knowledge and direct involvement, for that reason, I have abiding interest. And as you rightly said, this particular Vice-Chancellor was one of those Vice-Chancellors appointed under my watch as the President of Nigeria. He has been keeping me posted about the goings-on in the University itself and has been involved in what I am doing in the Olusegun Obasanjo Presidential Library (OOPL). And so, there is mutual interest, if you like, the University is interested in the progress we are making and I am interested in the progress the University is making. development of the University. I like what I saw and I can only wish the University success and the Vice-Chancellor, success, in all his endeavours, both as a Vice-Chancellor of UNAAB and whatever else he may undertake after that. UB: It’s like human resource is that major thing that we really have problems with in the country and with what we have seen today, it’s like we have some few of these ones, like you exemplified when you were in office, how do we get over this situation, Sir? person could become a bitter person and you cannot be sure of what a bitter person can do. UB: To groom leaders and Chief Executives like Professor Balogun, how do we motivate them further, such that they are of better services to the nation? OBJ: I have said that Prof. Balogun is still young and I believe he is a sort of man that the country will still need his services. I was particularly delighted recently when I found that the Federal government was going to create more Universities, they made use of those that can be regarded as successful University Vice-Chancellors in the past and I believe that when Prof. Balogun leaves his job as Vice-Chancellor, UNAAB, the nation will still require his services, he will be one of those that I will call ‘ready to be recycled’. UB: And as a person, are you now fulfilled for his appointment, for sticking out your neck then, Sir? OBJ: If you like, this should be one of the crimes that I committed when I was in office, but you know with this appointment, you can never be too sure. People are recommended, you, read about them, you read their CVs and you make enquires about them and you make appointment. In his own case, it wasn’t smooth sailing, there were other factors, that some other people would have wanted to capitalize on. But in the final analysis, I saw him as a good material and I say ‘let me put my bet on him’ and my bet has not been misplaced. UB : Thank you so much sir.